While David Gluck has only been inking bodies for a few years, he has been inking canvases for over a decade. 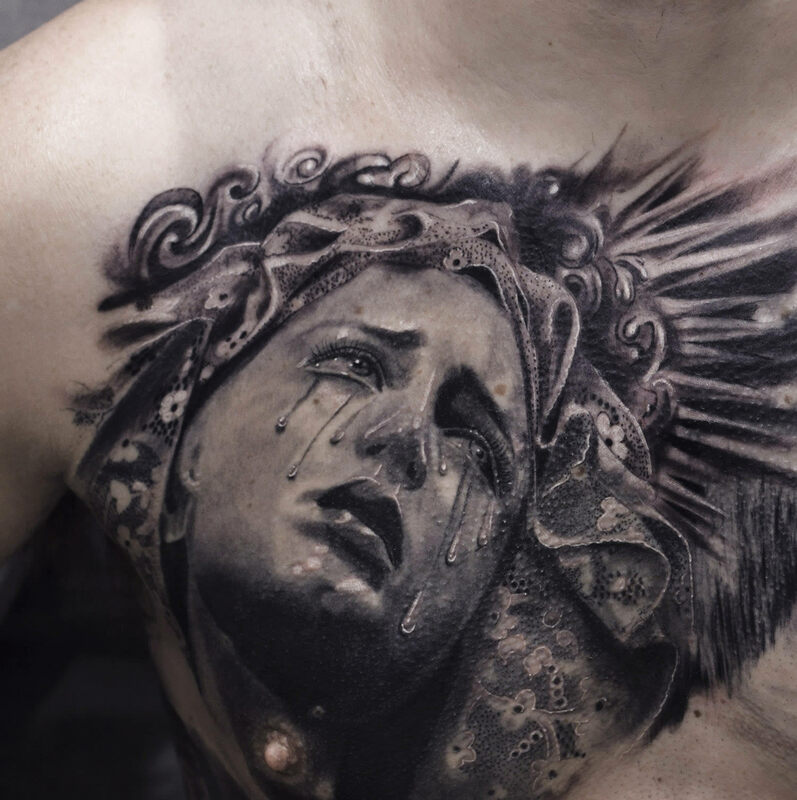 His oil paintings evoke classical artists like Rembrandt in their use of light and shadow, and through careful practice he has brought that style to his tattoos as well. 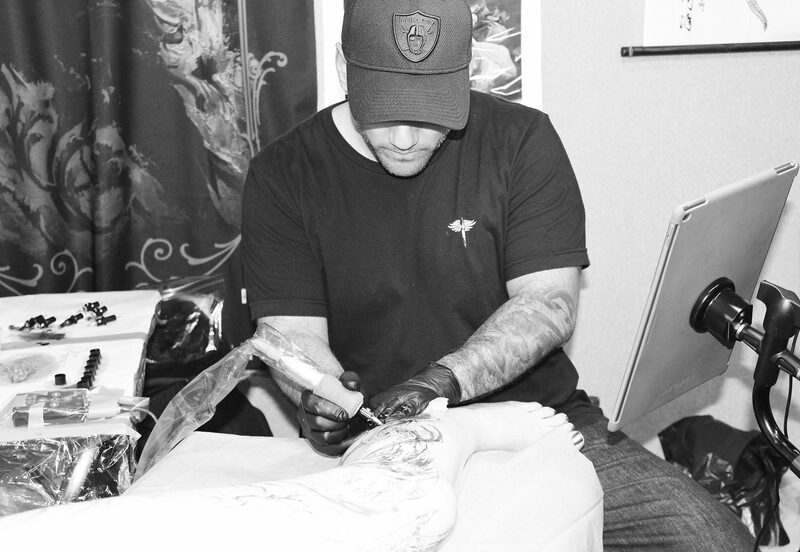 His friendly and engaging demeanor is as likely to win you over as his artistic acumen, and it was little surprise that he was booked well in advance during his time at the Van Isle Tattoo Expo. 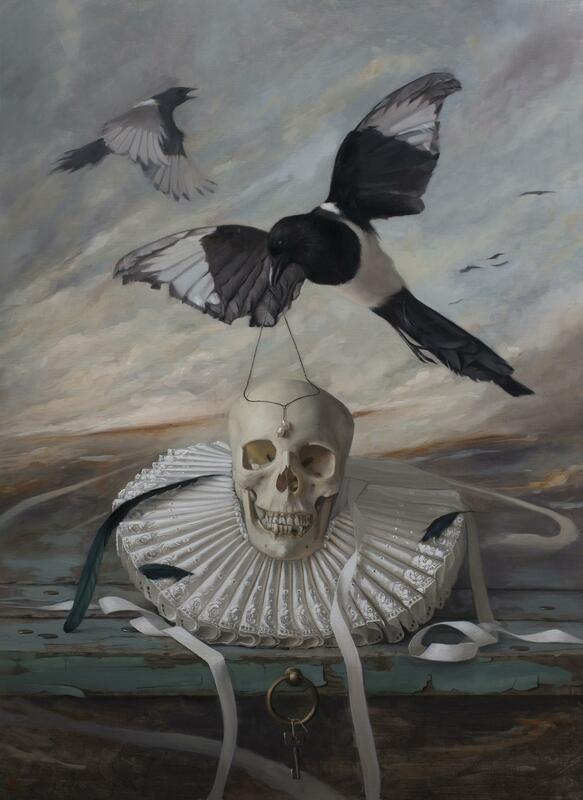 He is as quick to crack a joke at his own expense as he is to have a frank discussion about his experience as a visual artist in the gallery scene. Gluck’s experience alongside his wife and business partner, Kate Stone, have given him unique insight into what the art industry used to be and into where it is going. 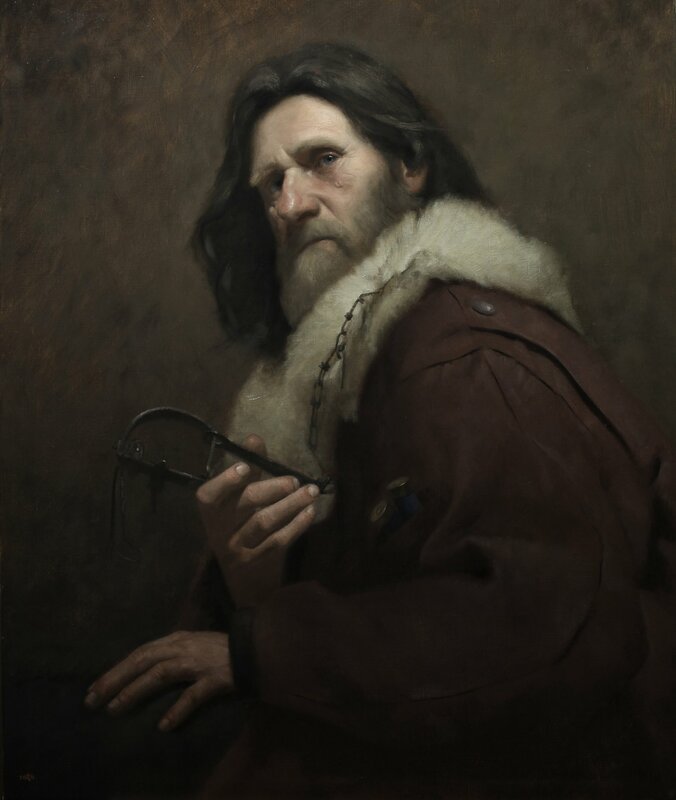 Gluck’s “The Trapper” (oil on linen) reminisces the work of Rembrandt. Pretty much 100% because I met my wife here. I was actually getting an undergraduate at Penn State University for Education and I came up to do some studies for an art school I wanted to attend. What turned into two weeks, basically resulted in me staying here three months until I was flat broke and had to leave. So I went back to the States, finished my teaching degree, loaded everything I own into the back of my wonderful 1994 Grand Marquis, drove to Canada on a working holiday Visa, and moved right in with my wife. But we had only really been dating six/seven months, and that was 11 years ago so . . . It was definitely worth it. We’ll probably never head back. We moved out to [Vancouver] island together. We used to live in Toronto and we were just ready for a change of pace, and really with how we did our business, like with the fine art thing (the tattooing thing is kind of more recent for us), we just found you didn’t have to live in the city. And since we are pretty much business partners with everything we did with fine art, we said “well why don’t we just live somewhere a little bit more remote,” somewhere that we’ll actually enjoy living instead of Toronto. Most of our business was in the states anyways, so that’s kind of how we ended up on the island here. I guess that would make sense since there is so much traffic from the States here. Yeah and actually (like I said) our whole art business was built around the US gallery scene; so really most people in Canada aren’t really familiar with our work as much. Gluck at work on the finer details of his religious piece at the Van Isle Expo. Your wife is still a practicing visual artist in that scene? Yes, and she does a lot of commission-based work and some gallery work and we’re moving a lot more to direct sales. That’s kind of the future of painting to be honest. The old model of the gallery is being a little bit more phased out from what it used to be. 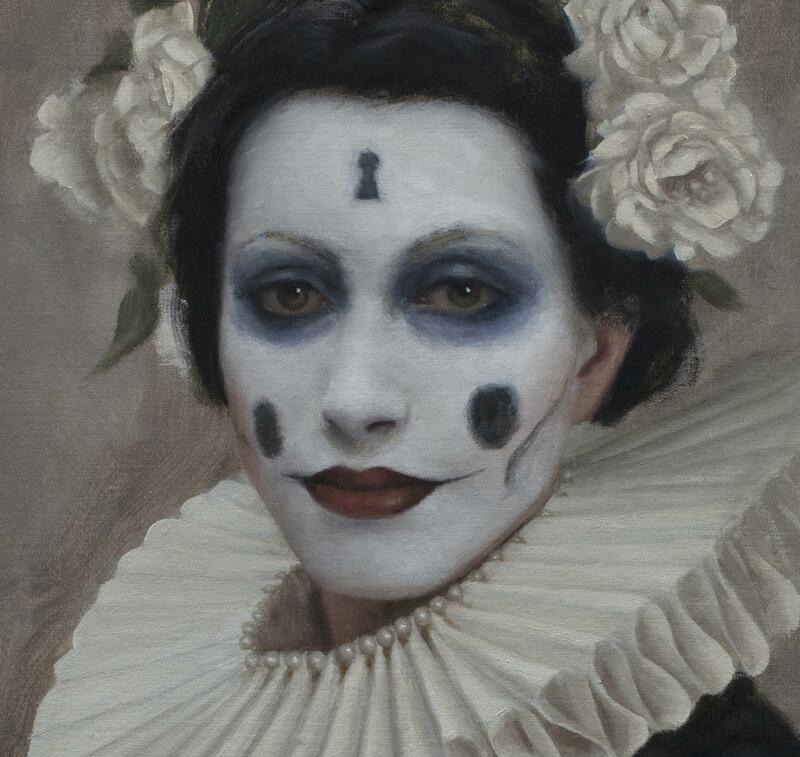 16-century ruffs reappear in another oil painting (“Adornment”). You are self-taught; a fine art painter and an instructor for years. What led you to become a tattoo artist from that? So. . . I guess we got interested because the art got stagnant, and we needed to do something. So my wife started tattooing with me. We went down and pretty much had a crash course over four months. We didn’t really do many tattoos, but we watched him. Which was good because we got to see a master tattooer, and really bad because he made it look really easy. So I was just like “oh I guess you just make some swooshy marks and then you get a perfectly rendered face. Great!” So when we moved back here and started working in a street shop there was a huge learning curve, and it took a lot of time to kind of figure out the skills and how some translate and some do not translate. 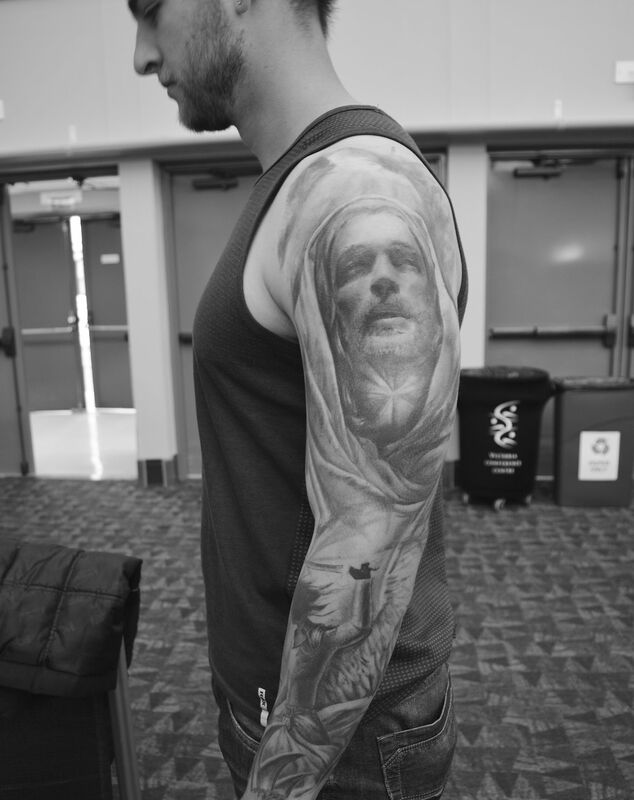 A look at the completed religious-themed sleeve. 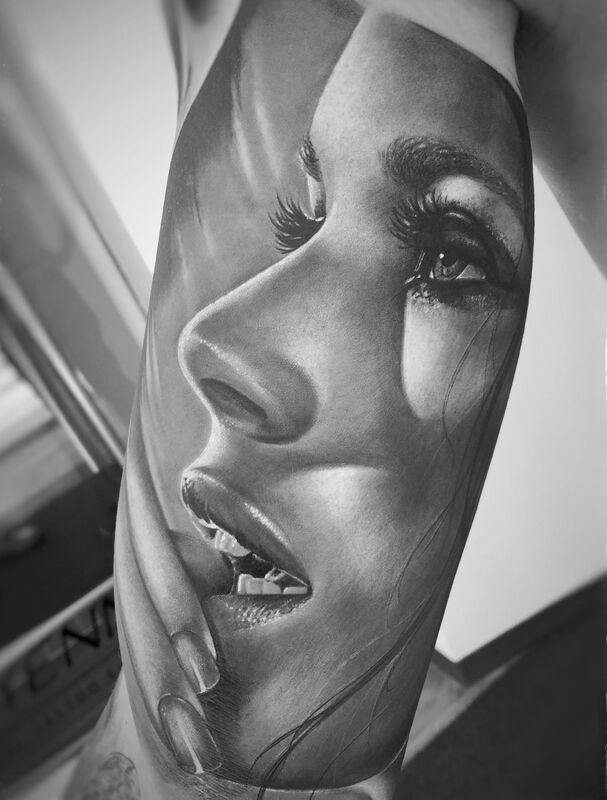 Your tattoos resemble your painting style to an absurd degree in the softness of shading, the composition, the themes—your visual art background is very apparent. 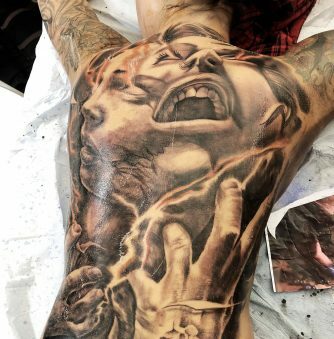 How easy or hard was it to transition to tattooing? It was unbelievably hard. It was the hardest thing I’ve ever done. A lot of people made this weird assumption that, it kind of put some pressure on me because everyone thought I was just going to be “the bestest” right away because “oh you’re such a good artist.” But it’s different, it has its own rules, um, it is a completely different medium, the application is completely different. 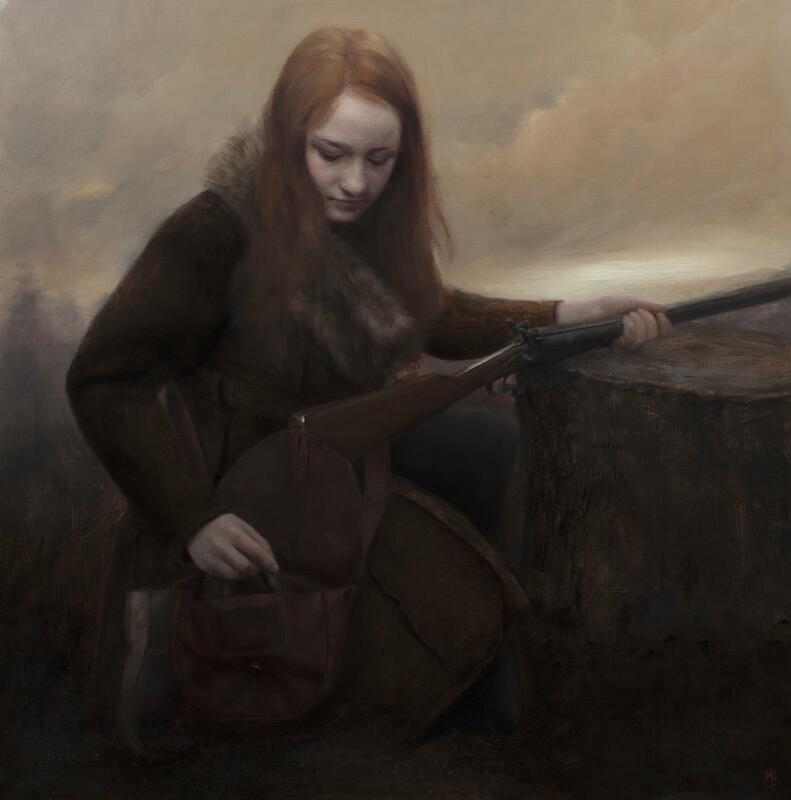 Just like oil painting and everything else you’re going to have to get years of practice before you’re competent at making something that’s good that will last. That was what was so hard for me was trying to figure out how do I actually put ink in skin without damaging things. It’s very easy to make a realistic image, it’s very hard to make it stay that way. I remember reading that the first tattoo you did was Abraham Lincoln’s face. It was an American traditional Abraham Lincoln skull. It was terrible. It looked like it was done on a roller coaster. I’m really glad the person lives in a different country than me so I don’t have to see it again. Y’know when we started it was hard because how do you practice? We watched somebody but that only helps to some degree. We were kind of on our own when we started – we were at a shop but the guy just said “there’s a chair, start working.” So we did a lot of free tattoos at night and just started trying to figure out what the heck we were doing. It was not an easy process, to the point where my wife said “I need to step away from this, I’m sick of the stress, I don’t feel like I’m getting anywhere.” Hopefully one day she will come back to it because I think she would be exceptionally good at it if she did. Pretty much that was our transition, and then here I am today I guess. “So of course I’m puttin’ a face in there,” Gluck, describing the piece where he has creative freedom. So would you say this was a commercial choice? Yes. At first it was. A lot of people might frown upon that, but you gotta do what you gotta do. I found for me I had an art background and I wanted to do something artistic. I felt like if I can make portraits and I can make realism, and have a similar aesthetic then why not? I think what kind of surprised me though is how much I ended up loving it. So now I really divide my time between the two careers. It’s three days a week tattooing, three days a week painting. So really I just split it down the middle, and it’s nice to have that balance. One of the additions to a larger sleeve from the weekend. 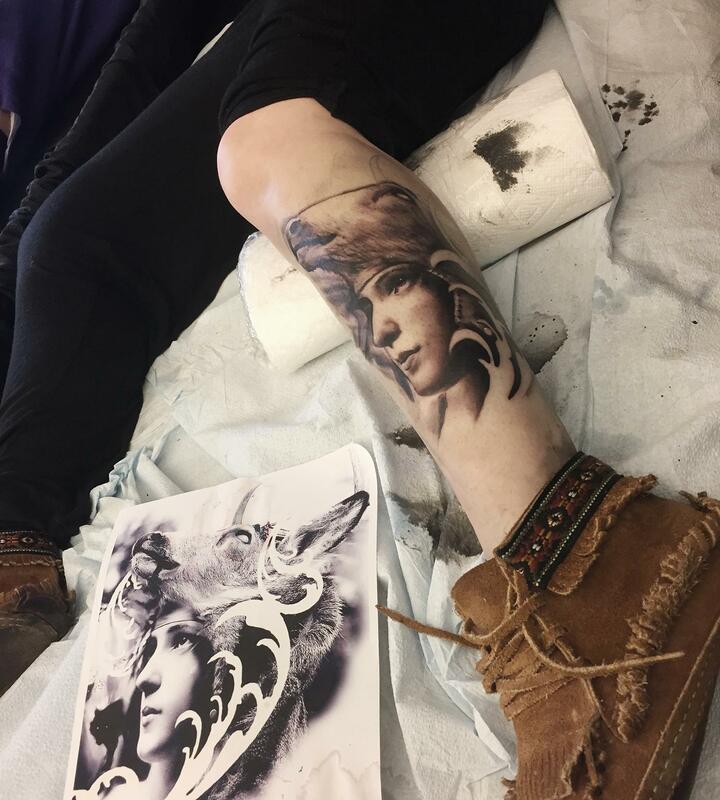 Have you received criticism from other traditional artists since you began tattooing? Y’know I used to, but what I have found is the people who are at the top of this industry, the people who I really respect, have been really really cool to me. 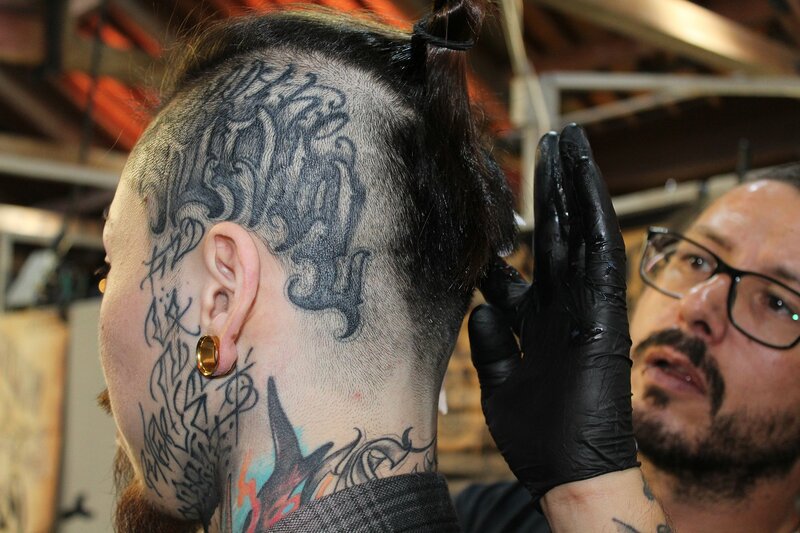 And I think what they felt is, in some ways they were almost flattered that somebody with such a traditional art background decided that he wanted to try tattooing, because I look at them as equal art forms. 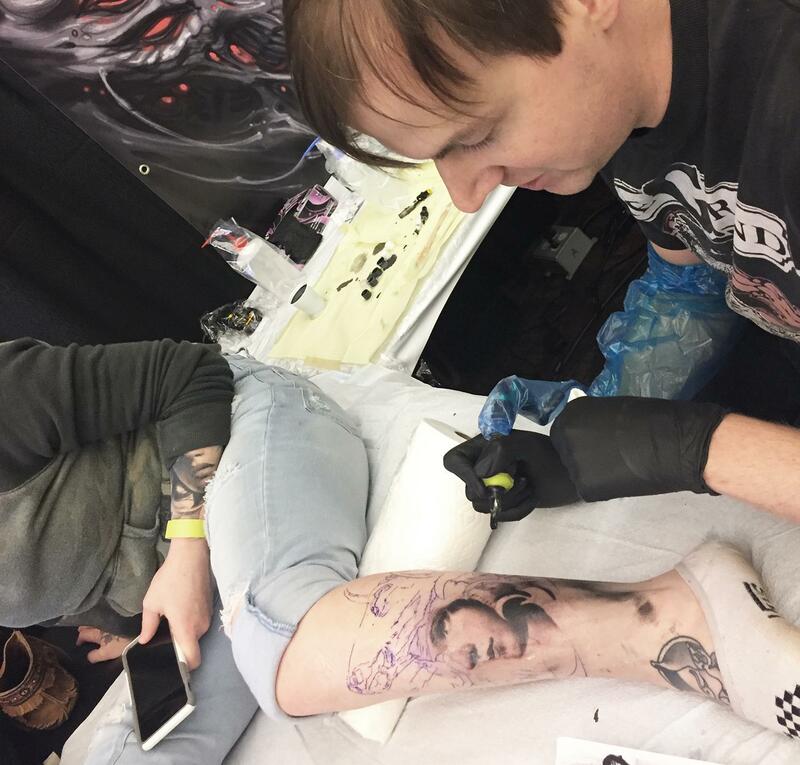 So, know, you’re always going to get criticism no matter what you do, but I found what I was more surprised by was how cool people were to me, and how some of the bigger name tattooers were reaching out and being very friendly. I was being invited to do a lot of different things in magazines and all this stuff. I was kind of surprised, I thought it would take a lot longer for my tattoo career to get going. 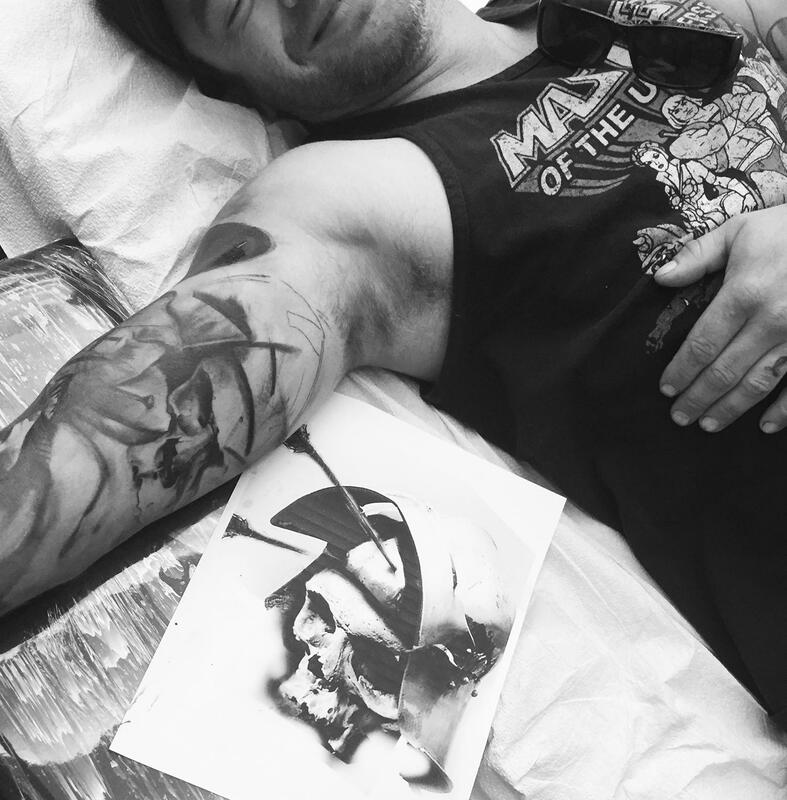 It took fifteen years for the art career to get to a certain level, then the tattoo career happened way faster. I’ve been thrilled to be part of the community. From paper to flesh, Gluck’s style is consistent. 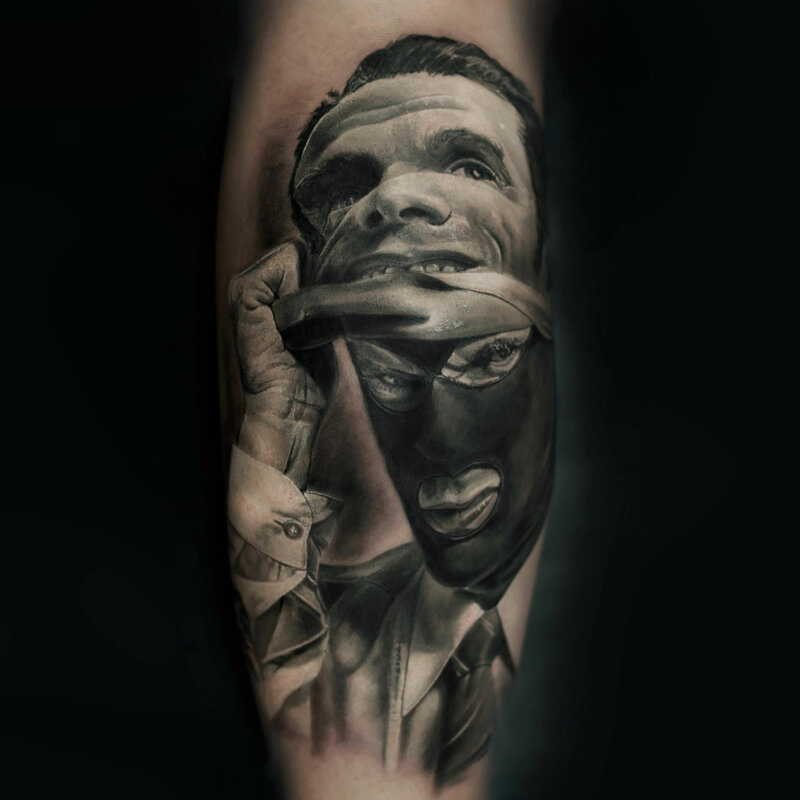 Do you think art galleries and museums are more accepting of tattoo artists nowadays? It’s hard to say. I actually curated a show that was kind of interesting a number of years ago called “Nexus.” The theme was tattooers would also oil paint. And I thought that was a cool approach to trying to combine both. But what I am finding now is that galleries, museums, these sort of things—especially gallery scene, they’re kind of on the down. They don’t have the foist in the art world that they used to, and um y’know just with the way people consume art and goods in general, it’s all through social media. A lot of tattoo artists I talk to, they aren’t even going to bother, and even fine artists, they aren’t even going to bother with those scenes, there’s no point. That’s one nice thing; I feel like art, regardless of the person’s background, they kind of take a little bit more control over how they distribute whatever they are doing. 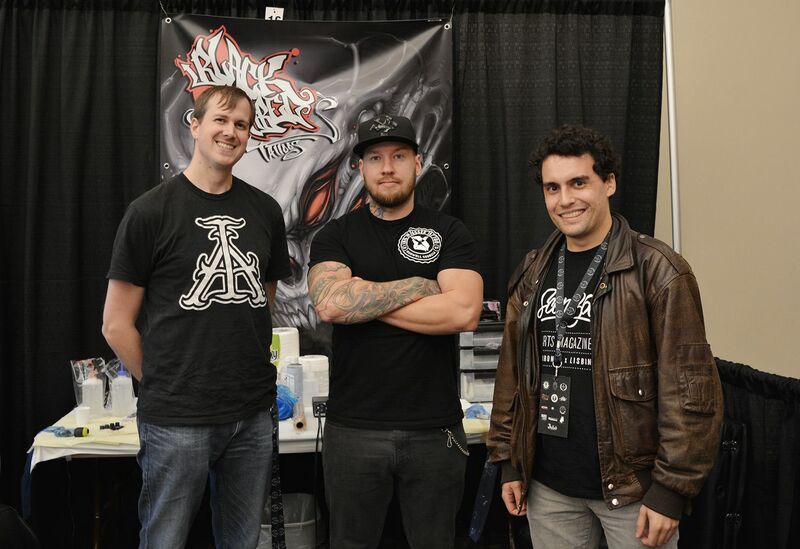 David Gluck and Teemu Hakala representing Black Label Tattoos at the Van Isle Tattoo Expo. 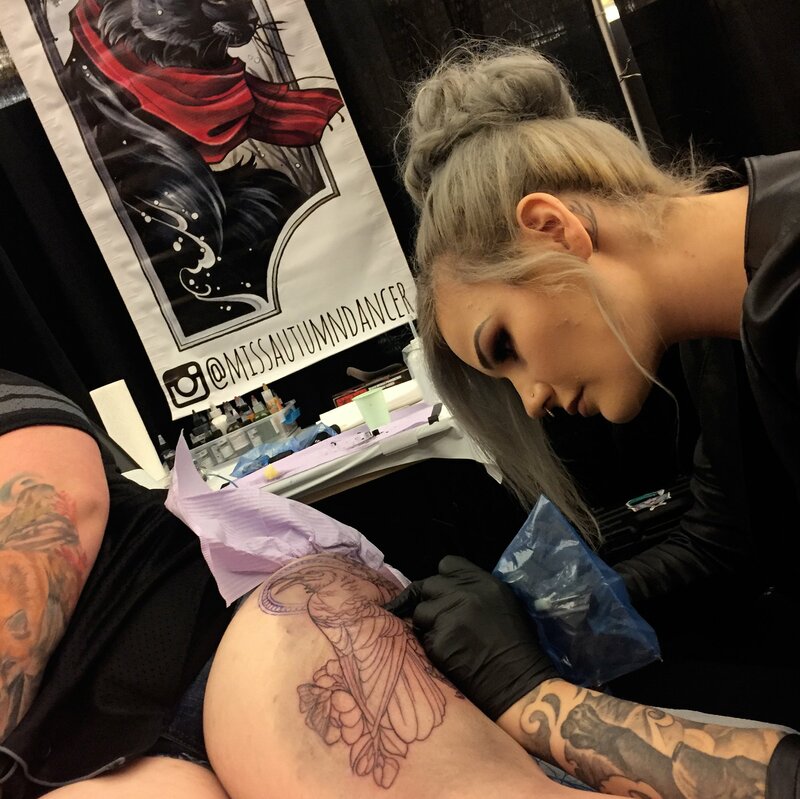 What are you tattooing at the Van Isle Tattoo Expo? It’s a lot of on-going pieces, umm. . .
Yeah, it’s always nice to work. I mean, tattooing is fun. It doesn’t lose that magic, that “wow I made something look realistic.” That still happens, y’know. I got that a little bit less with painting, but here I’m working on a religious-themed piece, a fantasy piece, and then I have another on-going client who I’m starting a fresh piece for where she just gave me complete artistic freedom, so it should be interesting. So of course I’m puttin’ a face in there, some animal stuff, and—I always default to what I really like to do. Can you give us a hint whose face it’s going to be? Actually a lot of the faces aren’t necessarily supposed to be a person, even in my own work. They’re more just a stand in, or the subject themselves should be able to represent anybody.